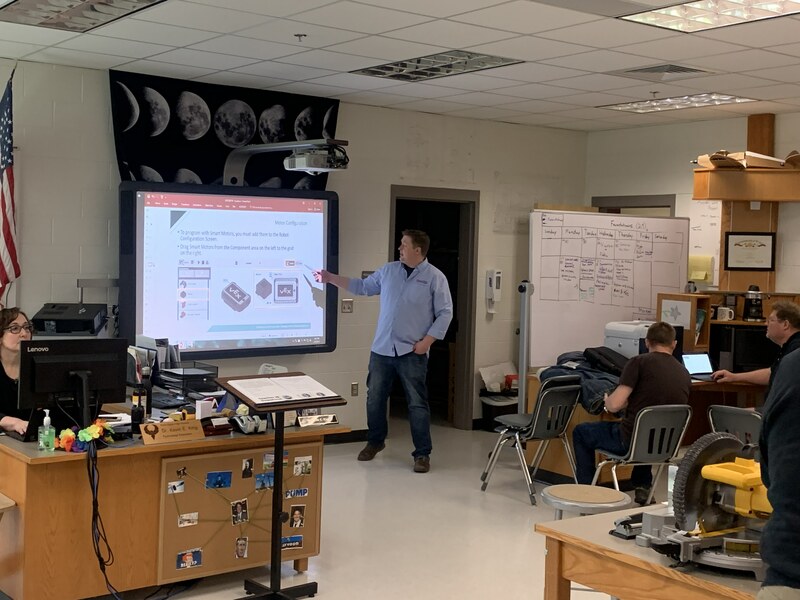 The Carnegie Mellon Robotics Academy (CMRA) team returned to Loudoun County this year for one of two Professional Development sessions for the 2019 year. Loudoun County is continuing the growth of its Robotics Program. This year, they intend on implementing the brand new VEX V5 system into their offerings in multiple high schools in hopes of having a continuum within their school district. Last year, CMRA held a training session to prepare over a dozen middle school teachers. With the high school programs, students coming in will have the chance to incorporate robotics into their engineering design projects. The 2019 training session offered a building lesson of the new V5 clawbots and teachers got hands-on experience with the new hardware platform. The V5 clawbot features a four-wheeled design and a gripper that can be used to pick up objects. Participants learned about the new touch screen and how to program the display to show text and shapes. After learning the basics of the hardware, the teachers also learned basic commands to move their robots. For the next session, the participants will complete their robot designs and also gain some experience in using the new sensors that come with the V5 robot.